With 55.0.3 I can view XML contents directly in the browser, even in clean profile. With 57, it's either blank or a single line of numbers or something. So far no luck finding an extension to help with it. 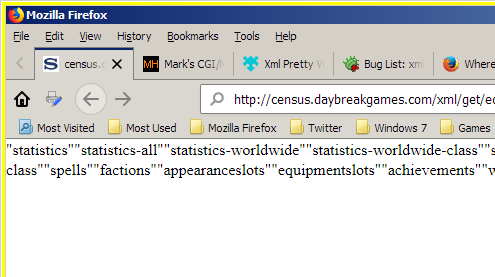 It did find a JSON viewer http://census.daybreakgames.com/json/get/eq2/ but sometimes easier to read the XML. Anyway, I'm just trying to get my beta install as close to my normal one and I've found many extensions that replace the functionality of my Legacy ones. The XML thing was just a basic Firefox behavior. Hmmm.. Well, suppose I can use the Web Developer interface to view the code. Moving to builds since beta is not a release. I just tested the XML file in Fx Portable Release 56.0 and Fx Portable Beta 57.0b3. Same result in both versions. The pages look normal like your image for Fx 55.0.3. Now it's working with my normal profile. What gives? Very interesting. thank you for feedback. nevertheless chromium and also fireox 58 do not show a formatted xml content. so at least its still a server error.